Background: Radiation therapy is widely used for the treatment of pituitary adenomas. Unfortunately, it might raise the risk of ischemic stroke, with neuroinflammation being a major pathological process. Astrocytes are the most abundant cell type in the central nervous system and have been reported for playing important roles in ischemic stroke. Objective: Here we studied how γ-radiation would introduce astrocytes into a detrimental state for neuroinflammation and provide new theory evidence and target for the clinical management of inflammation- related neural damage after radiation-induced ischemic stroke. Method: HA-1800 cells were treated with γ-radiation and then the protein and mRNA levels of Connexin (Cx)-43 were evaluated by western and q-PCR. The culture supernatant was collected and the concentrations of the inflammatory factors were determined by ELISA. MiRNA complementary to Cx-43 was designed through the online tools. Results: Cx-43 is upregulated in the treatment of γ-radiation in astrocytes and γ-radiation introduced the detrimental function of astrocytes: cell viability was reduced while the apoptotic cells were increased. Inflammatory factors like tumor necrosis factor alpha, interferon gamma, interleukin-6, interleukin 1-beta were dramatically up-regulated by the irradiation. 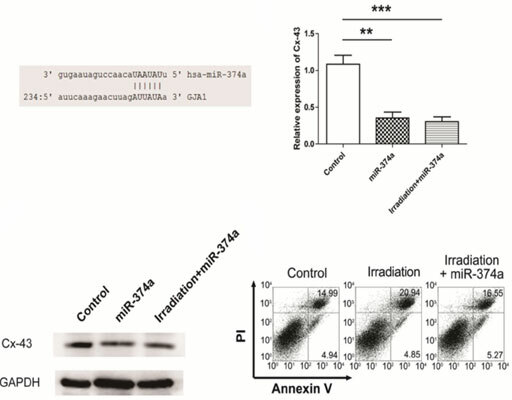 MiR-374a rescued irradiation induced Cx-43 up-regulation of astrocytes and eliminated detrimental function triggered by γ-radiation. Conclusion: Cx-43 expression level may play an important role in the inflammation-related neural damage after irradiation-induced ischemic stroke. Keywords: Ischemia, Stroke, Cx-43, Astrocytes, MiR-374a, neuroinflammation. Keywords:Ischemia, Stroke, Cx-43, Astrocytes, MiR-374a, neuroinflammation. Abstract:Background: Radiation therapy is widely used for the treatment of pituitary adenomas. Unfortunately, it might raise the risk of ischemic stroke, with neuroinflammation being a major pathological process. Astrocytes are the most abundant cell type in the central nervous system and have been reported for playing important roles in ischemic stroke.